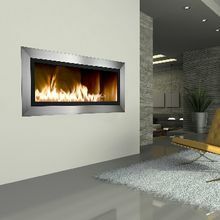 The Xtreme fireplace by Fireplace Xtrordinair offers the most dramatic, linear gas fireplace available on the planet with an extensive presentation of flames; limited edition interior fire-art; interior top-and-bottom lighting; three liner options; three glass floor media options; and built-to-suit exterior surround options. The Xtreme features 1,200 square inches of fire viewing area with a large, proportional arrangement of flames. It can be operated for low-to-no heat output, or direct heat to adjoining rooms via power heat ducts (within 25’ of the unit). • Power vent exhaust fan is designed to allow for additional installation options by pulling excess heat off the unit and releasing it outside.